Micorosft has continued their rapid pace of releaseing new version of Windows 10 and has now released a the 1607 Anniversary update. As with any new major release of Windows there is of course an updated and new Group Policy settings. Therefore the Group Policy team have now released an update Group Policy setting spreadsheet that is an excellent reference to find all the new settings. If you are not familiar with this spreadsheet(s) they are a reference sheet done by the Group Policy team taken from the ADMX files of each of the OS releases. This makes it very easy to find details about each GPO including what registry keys are set based on the policy setting. 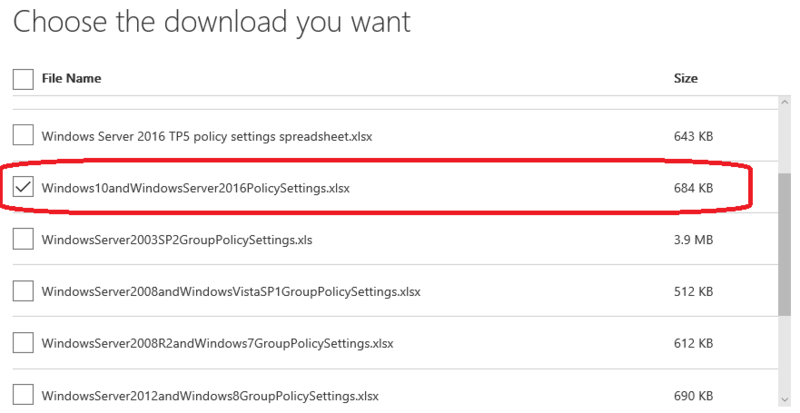 In case you are not sure the “Windows10andWindowsServer2016PolicySettings.xlsx” is the version for 1607. ← Security Compliance Manager 4.0 now available for download! Corey Poturalski liked this on Facebook. Bill Polymenakos liked this on Facebook. Wellington Silva liked this on Facebook. Nicolas Barrow liked this on Facebook. Yavuz Taşcı liked this on Facebook. Павел Рыбин liked this on Facebook. Damjan Lukežič liked this on Facebook. Serg Marinichev liked this on Facebook. Bheki Gift liked this on Facebook. Pavel Yannara Mirochnitchenko liked this on Facebook. Mariusz Siatkowski liked this on Facebook. Danny Ilbrink liked this on Facebook. Thomas Bierschwale liked this on Facebook. José Proença liked this on Facebook. Matt Nelson liked this on Facebook. Walt Johnson liked this on Facebook. Fredrik Brandl liked this on Facebook.